This student plastic clarinet is great for kids and adults alike wanting a great beginners clarinet. 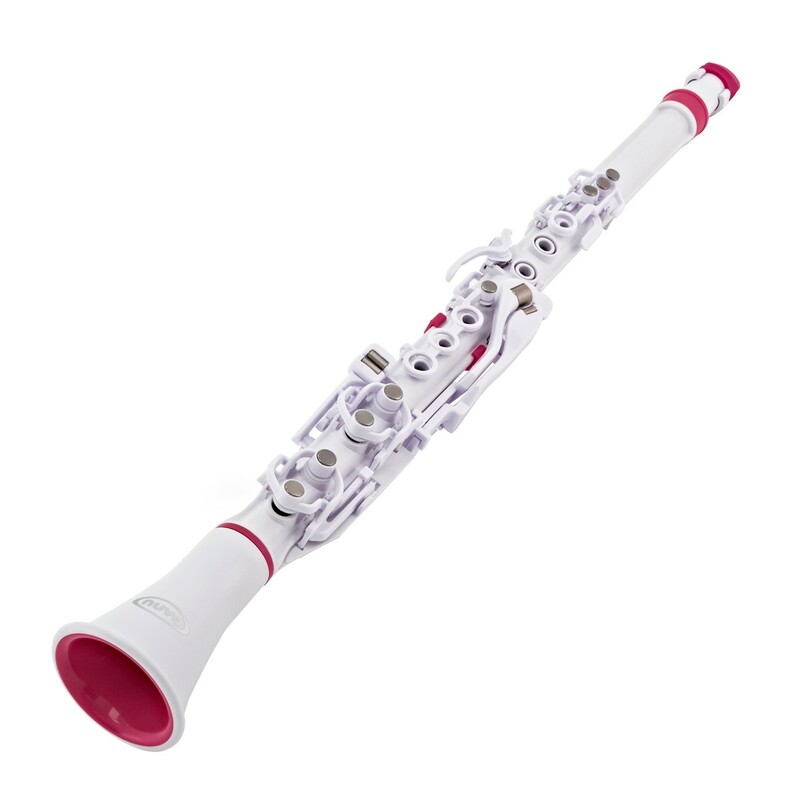 The ABS plastic instrument is one of the most novel clarinets for sale and is suitable for children and adults alike. 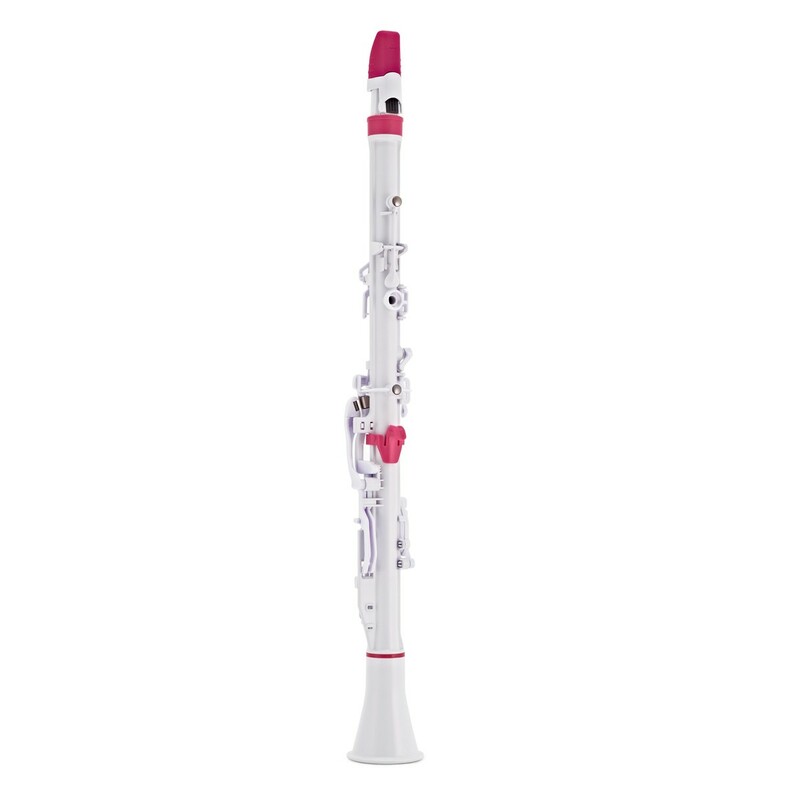 In the trendy White and Pink colour, this easy to use, lightweight instrument also sounds extremely realistic! The body of the Clarineo is split up in to three easy parts making it simple to construct and take apart. It also makes it more durable than a standard clarinet, meaning it is less likely to break if it gets knocked over. The bell is fastened with a bayonet style clip mount, making it easy to fasten on. 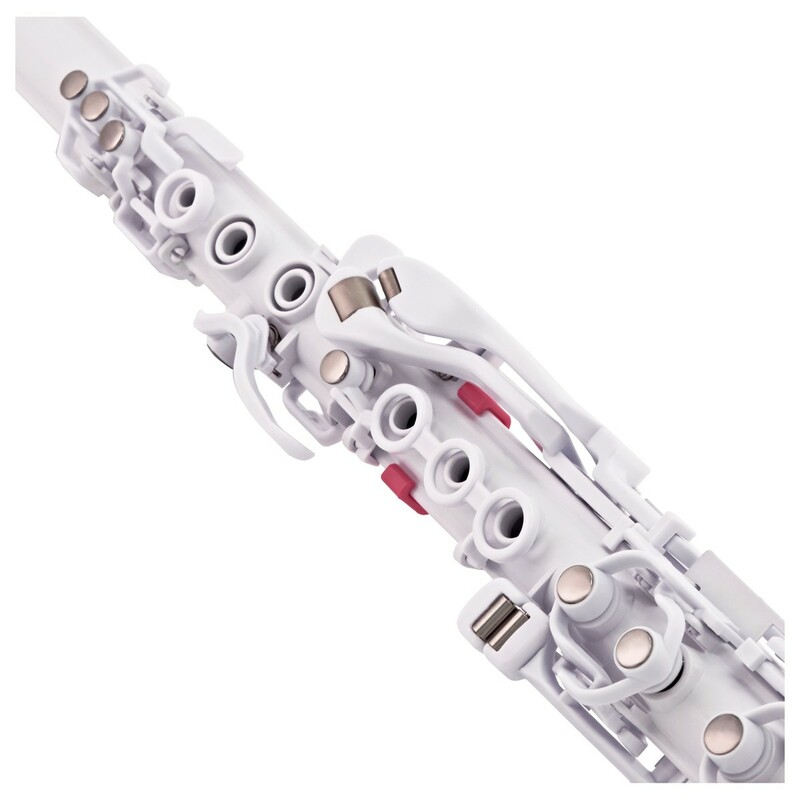 Many months have been spent designing the Clarineo to make it not only light and hence suitable for kids with it being 33 percent lighter than a standard clarinet, but also a great sounding instrument with a superb tone. All the key springs are made from complex rosin so that, even after lab tests of up to half a million depressions, there are no signs of wearing. They are also incredibly quick, meaning that you can a better response from the keys. The pads are made from a silicone material meaning they are 100 percent waterproof and self-levelling (meaning they cannot go out of adjustment). The tone holes are smaller than those on a typical Bb clarinet, making it easier for children with small fingers to fully cover the gaps. The mouthpiece and ligature design for the Clarineo is a simple and effective method in comparison to the traditional method. 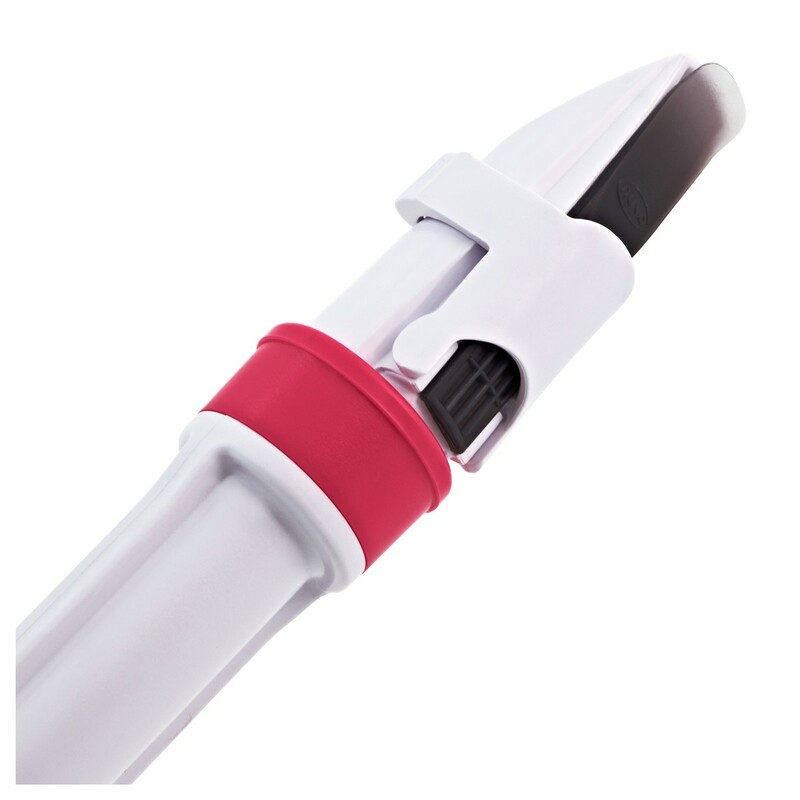 This instrument features a snap shut ligature, meaning there are no screws to adjust and allows for quick repositioning if necessary. The instrument comes with one standard Rico Reed and one specific synthetic reed, which has a really long lifetime. Being in the key of C, the Clarineo is a great instrument for instrumental teaching lessons. It makes it much easier to play with other woodwind instruments such as the flute and the oboe, and most importantly easy to play along with the piano. Being of a plastic construction, the clarinet is easily cleaned and sanitised if more than one student is playing the same instrument. 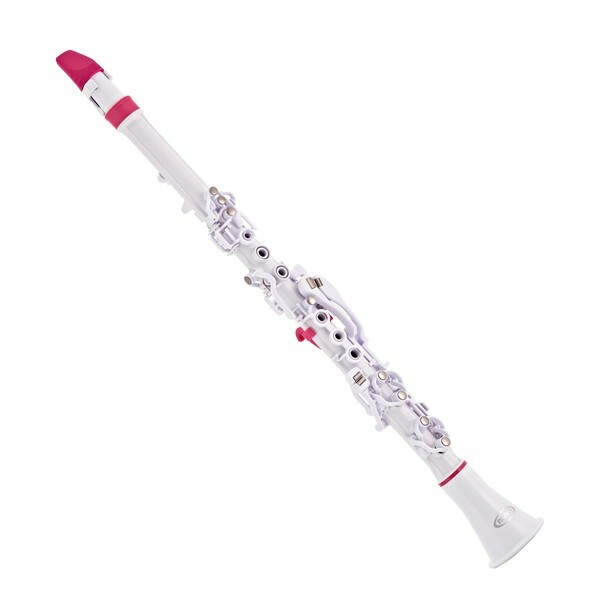 "The product was considered to be excellent value, especially compared to conventional clarinets and this made it more accessible to children. The company has addressed all the factors which inhibit children form learning the traditional Bb flat clarinet, its weight, size, cost, fragility and difficulty in producing notes, and remedied them. The company has taken a new approach to a conventional instrument without it being electronic. This was a pioneering use of plastics incorporating a clever use of moulding. The result was a very robust instrument with a good acoustic quality."